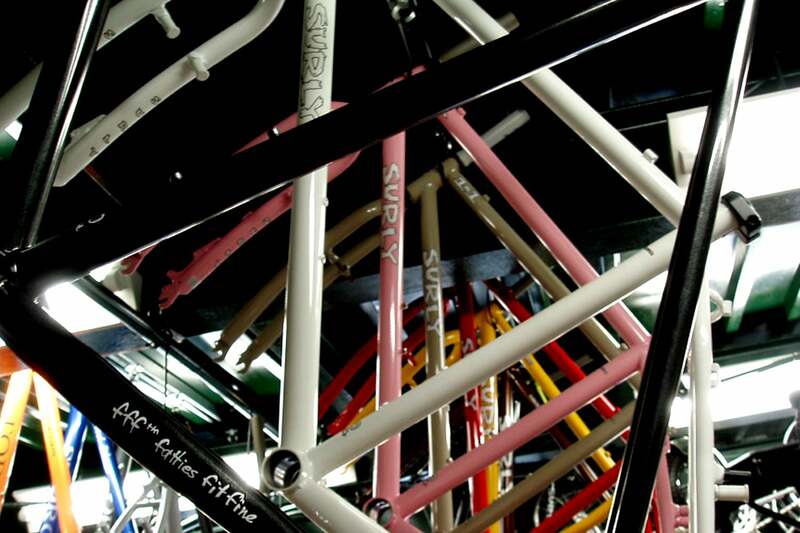 We're cleaning out a corner nook, in our office area, to make room for a new Surly employee. Our storage cabinets had to go away, and I accepted the offer to take one home and put it to use in my shop. I don't drive to work...haven't had to do so since I broke my femur in 2007. So my cargo bikes and trailers get put into service any time I need to haul something to and/or from the office. 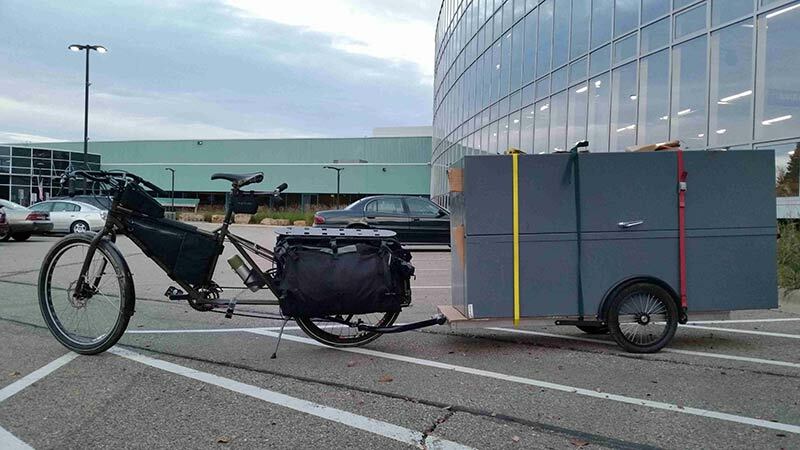 In this case, I utilized my Big Dummy and my Bill Trailer for the task at hand. I knew the cabinet was heavy, but I didn't think it would exceed our trailer max load rating: 300 lbs. So, with the help of some co-workers, I loaded it onto the trailer and strapped it down for the ride home. I later found out that I was hauling 330 lbs. of steel, plus some added weight of packing materials and straps. As soon as I started pedaling, I predicted that my 16-mile commute would be a slow one. The weather was favorable, and I felt physically capable of propelling the 15-foot velo-train. But I knew I'd be at the mercy of gravity and friction for the majority of the haul. 20+ years of commuting have taught me that a slow and steady approach to moving heavy, bulky, top-heavy cargo tends to work well. So I did my best to find that happy medium. If I pedaled too slowly, the trailer would push the bike and set up weird oscillations in the tires and/or hitch assemblies. If I went too fast, there would be no chance of panic-stopping or swerving to avoid contact with an inattentive motorist sharing the roadway with me. Midway through my ride, I received a phone call while rolling along. I didn't recognize the number, but it was local and I answered. It was Francisco. He was bummed out, because he had purchased some pills and they weren't what he'd expected. He wanted to know if I could get him more of the yellow ones that he’d obtained previously. I don't know Francisco or anything about his pill situation, but I decided to play along for entertainment value. The conversation continued until I needed to put both hands back on the handlebar in order to come to a stop at the stoplight. At that point, I informed Francisco that he'd dialed a wrong number and I wished him luck in his pursuit of the drugs he so desired. When he finally figured out what was going on, he simply said "Oh" and hung up. That was fun...for me. I stopped a couple times, along the way, to pound down an energy drink (Full Throttle, Bro!) and a smoothie I’d made that morning. I finally pulled into the driveway around 9:30PM. Door-to-door commute time was 2.5 hours. I averaged less than 7.5 MPH over 2 hours and 10 minutes of actual riding. It wasn't the most enjoyable ride of my life, but it does put things into perspective...most of my other rides seem pretty easy, in comparison. It's good to challenge one's self, from time to time. And I feel that using a car is lame if you can accomplish the same thing on a bike. I don't recommend overloading our trailer...or any trailer. Hauling more than 200 lbs., regardless of the trailer load rating, can get sketchy at times...even when the road conditions and weather conditions are good, as they were when I pulled the cabinet home. It's always possible to exceed the limits of traction and braking control in these scenarios. If you need to tote a heavy and/or cumbersome pile of treasures, use caution, take your sweet time, and answer your phone when Francisco calls.